Meet Flo. Tired of the rat race, she’s quit her job as an stockbroker. Now she’s trying her hand at running a restaurant, and it’s up to you to help. 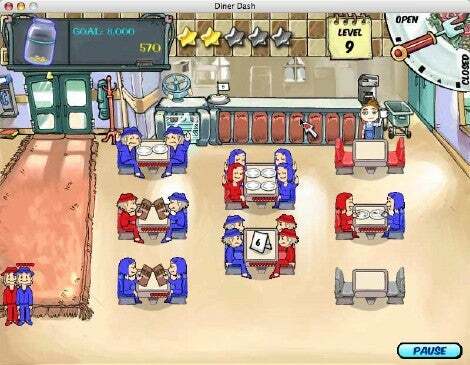 Welcome to Diner Dash, casual game maker PlayFirst’s first Mac title, which they introduced at Apple’s Worldwide Developers Conference (WWDC) 2005. In Diner Dash ( ), Flo’s a veritable cyclone of activity: She’s in charge of everything from seating customers to giving them menus, taking their orders, serving and cleaning up after them (fortunately there’s a cook in the kitchen to make the meals). It’s a bit like the classic arcade Tapper, except instead of just beer, you’re serving up full meals. The faster Flo waits on tables, the happier the customers are, and the bigger the tips they’re likely to leave behind. The more tips she collects, the more money Flo can roll into her little business. Each new level brings with it a new revenue goal, which helps Flo grow her business from a greasy spoon diner to a real honest-to-gosh restaurant with tablecloths and everything. Fail to meet the level’s revenue target or upset a customer enough to make them leave, and that will cost Flo a star — lose all of the stars, and the game ends. There are ways to get bonus points: You can match customers wearing green, red and other colors to similarly-colored seats — that makes them happier and earns you more, for example. And the less time it takes you to take orders and bring customers their food and the check, the bigger your tips will be. Along the way, you can purchase powerups, if you will, that enhance your restaurant: A snack station, drink station, podium, stereo system, live performers, even running shoes or a faster oven. These all generate revenue for your restaurant if you use them effectively. And as you gain money, you can also put your restaurant through four different remodels that let you serve fancier food and more patrons. Fortunately, Flo’s good at multitasking: She can carry dishes in one hand while bringing another customer his check. Figuring out how to maximize’s Flo’s efficiency is paramount to succeeding: Waste too much time making multiple trips from the counter to the table is likely to cost Flo some money in tips. There are 50 levels in all, and five different kinds of regular customers to cater to. Seniors, for example, are willing to wait longer for a table, but don’t tip as well. Business women are good tippers but quite impatient. And heaven forfend if you don’t treat the restaurant critic well — she’ll cost you points if she leaves unhappy. Young ladies, college students and “Mr. Hot Shot” complete the mix, all with their own personalities. If you’d like to step the action up a notch, you can try out the “Endless Shift,” which lets you serve an endless stream of customers as fast as you can, managing upgrades to the restaurant on the fly. The shift is over when you run out of stars. It’s a fun, if ultimately frustrating, diversion — after all, there’s no end to it, and you’ll keep having to go faster and faster. Multiple difficulty levels and the ability to serve at any of the restaurants Flo’s unlocked as part of the career mode help to keep it interesting. Diner Dash uses a hand-drawn cartoon style that’s cute and family-friendly. The soundtrack and sound effects are adequate, but I wish there were more audio cues to let you know when it’s time to take action — you’ll hear the chef ring a bell when it’s time to pick up an order, but otherwise you need to keep a careful eye on the screen. Controls are a simply point-and-click affair, but I also occasionally got frustrated when I’d click just slightly away from where I was supposed and nothing would happen. There’s a timed demo you can download from the Web site so you can try it for yourself. The bottom line Diner Dash is a fun if somewhat frustrating action arcade game that harkens back to the classics. If reliving your Tapper days sounds like a good time, give it a shot.